Seven-Card Stud requires patience. Because you’re dealt three cards right off the bat — before the first round of betting — it’s important that these cards are able to work together before you enter a pot. In fact, the most critically important decision you’ll make in a Seven-Card Stud game is whether to enter the pot on third street — the first round of betting. The next critical decision point is whether you should continue playing on the third round of betting, called fifth street. In fixed-limit betting games, such as $6-$12, fifth street is where the betting limits double. There’s an old adage in Seven-Card Stud: If you call on fifth street, you’ve bought a through-ticket to the river card (the last card). 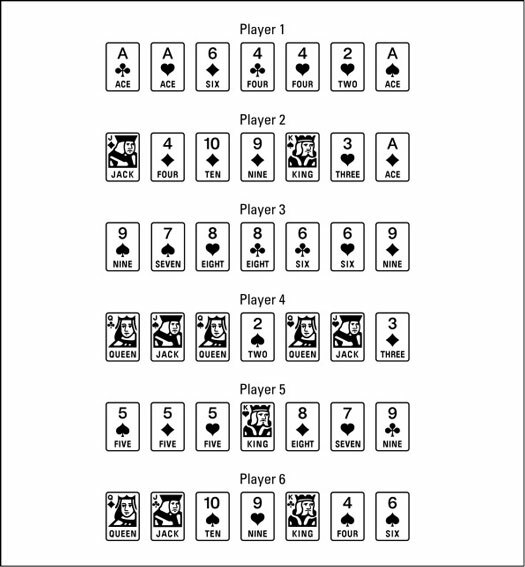 Figure 1 shows a typical hand of Seven-Card Stud after all the cards are dealt. The first three cards, beginning from left, are considered to be on third street, the next single card is fourth street, and so on, until seventh street. Figure 1: A sample hand of Seven-Card Stud. Player 1 now has a full house, aces full of 4s. He is likely to raise. Player 2 has an ace-high diamond flush. Player 3, who began with a promising straight draw, has two pair — 9s and 8s. Player 4 has a full house, queens full of jacks, but will lose to Player 1’s bigger full house. Player 5 has three 5s, the same hand she began with. Player 6 has a king-high straight. While most stud games do not result in this many big hands contesting a pot, you can see how the best hand changes from one betting round to another, and how a player can make the hand he is hoping for, yet not have any chance of winning.